LSOpenURLsWithRole() failed with error -10810 for the file /Applications/RubyMine.app. Updating the JVM version in Info.plist makes no difference. I have java 1.6 installed, which was what corrected this issue after updating to El Capitan originally. Interestingly, I can open RM by double clicking RM from the installer, just not from the Applications directory. Just tried reverting back to RM 7. Installing RM 7 or 8 with the bundled jdk, the application fails to start, but going back to RM 7.1.4 without the bundled jdk works. It seems that as of the latest version upgrade announcement, the bundled jdk versions are the default. This isn't too surprising since the issues listed on this page seem to be fixed. Have you reported those Java issues upstream/submitted the patches ? Guillaume DIDIER - No, other than this support forum, I'm not sure where else to report it. I mentioned it in this ticket, since it seemed related, but it sounds like the issues here were fixed for versions prior to El Capitan and I should create a new ticket. Danny Anderson, I was asking if Jetbrains had reported the bugs in the article upstream. Sorry for the confusion. No problem. This is the first time I've had an issue that I needed to report, so I'm not totally clear on the process. Thanks for clarifying. I am seeing an issue with IntelliJ IDEA 14 and 15 on OS X 10.11.2 (El Capitan). 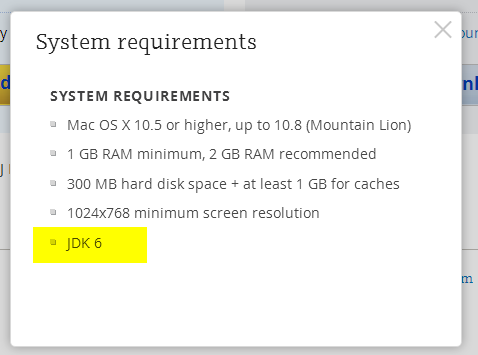 I had only the JDK 7 installed. * I tried modifying the Info.plist (yes I know that invalidates the CodeSignature) to remove the "1.6+,"
* I tried reinstalling the latest IntelliJ IDEA versions of 14 and 15. Launching 15 worked once, but once I updated some plugins and restarted, I was stuck in the "Java not found" error loop again. I eventually removed ALL versions of JDK from my system, reinstalled the latest JDK 7, 8. Then, only after installing the linked version of 6 https://support.apple.com/kb/DL1572, did IntelliJ IDEA work. Webstorm 11.0.3 with bundled JDK doesn't start on OS 10.11.3. I tried installing JDK 1.6 from Apple support and it still doesn't work. I have not modified the plist file. What am I missing? EDIT: restarting OS X fixed it.